Numerous factors impact the sale of a home—including timing. The ideal time to list a home for sale this year is between May 1-15, according to a recent analysis by Zillow. Homes listed within the two-week window sell for 1 percent more than the average home for sale, and also nine days sooner. The window varies, however. In Baltimore, Md., homes listed at the market’s ideal time—April 1-15—sell 21.5 days sooner, the fastest of the top 25 metro areas; homes in San Francisco, Calif., listed at its ideal time, May 16-31, sell only 5.5 days sooner. Home sellers in Portland, Ore., Sacramento, Calif., and Seattle, Wash., gain the highest average premiums by percentage when listing at their market’s ideal time, at 2 percent in Portland and Sacramento and 2.5 percent in Seattle. Sellers in the New York-Northern New Jersey metro area, Miami-Fort Lauderdale, Fla., and Phoenix, Ariz., gain the lowest, at 0.7 percent in New York and Northern New Jersey and Miami-Fort Lauderdale and 0.8 percent in Phoenix. The premium, naturally, is relative to the market. A 1.3 percent premium in San Francisco equates to $10,200, while the same premium equates to $2,500 in Chicago, Ill., and $1,800 in St. Louis, Mo. 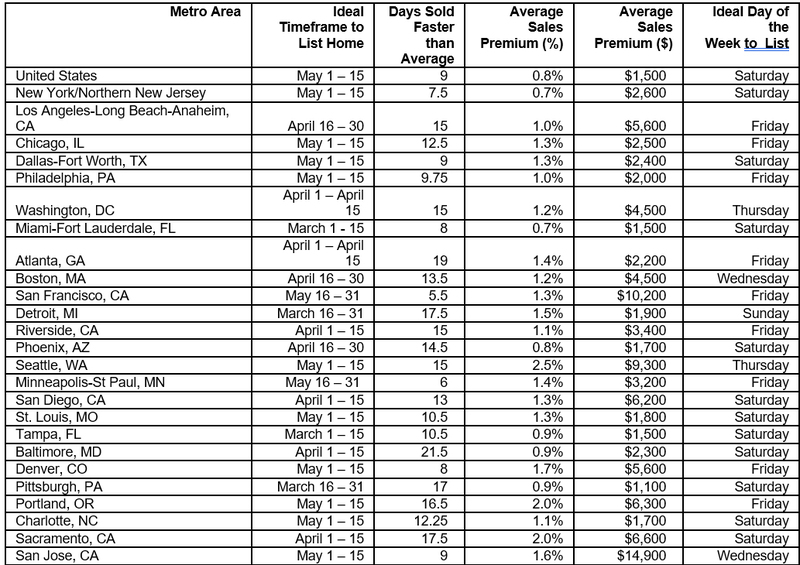 The analysis also identified ideal days of the week for listing a home based on Zillow data. Homes new to Zillow on Saturdays are viewed 20 percent more in their first week on-market than those new to Zillow earlier in the week. For more information, visit zillow For the latest real estate news and trends, bookmark RISMedia.com. With the many different projects reported annually in Remodeling Magazine’s Cost vs. Value Report, not much has changed from last year…and that’s not a bad thing. The 29 projects found on this year’s report paid back an average of 64.3 cents on the dollar in resale value. Looking at the 24 most tracked projects (projects consistently tracked for the last six years), their payback for 2017 was also 64.3 cents—only three-quarters of a penny higher than 2016 projections. Why the little change? Simply put: the differences in underlying numbers was minimal year-to-year. The average cost for those 24 projects rose a meager 3 percent, while the value that real estate professionals put on said projects only rose 4.2 percent. Minor gains, yes, but we’ll take what we can get. Recent and long-time trends continued, reports Remodeling. Curb appeal projects like changes to doors, windows and siding garnered a higher ROI than work done inside the home. Replacement projects, like doors or windows, scored higher among real estate pros than did remodels. Regionally, the Pacific division (California, Oregon, Washington, Alaska and Hawaii) saw an average payback of 78.2 percent for all projects, with 10 projects posting cost-recouped levels of at least 90 percent. The East North Central states of Ohio, Indiana, Michigan, Illinois and Wisconsin, however, saw an average of just 54.9 percent, with no single project offering a payback of as much as 80 cents on the dollar. The 2017 Cost vs. Value Report compares, across 99 markets, the average cost of 29 popular remodeling projects with their average value at resale one year later. Average resale value is calculated based on estimates provided by real estate professionals. View the full report, including project descriptions and city-level data, here. That’s just one example of some unwise habits homeowners have. If those owners are sellers opening their doors to the public for showings, habits such as these put them in even greater danger. The above example is a good warning to give to your clients now, since we’re in the holiday season. But use it as a jumping-off point to have a deeper conversation about safety — and to show that your safety knowledge is an asset to sellers. Consider using this checklist (you can request it as a customer handout on my website) during listing appointments to better prepare prospective sellers and show your value as a real estate professional. We spend a lot of time telling sellers how we’ll market their home, and while that is obviously important, we rarely address their true concern: how to keep their home safe while it’s open to the public. Touch on these 10 anti-burglary tips so your clients will know that you have their best interest at heart. A burglary is committed every 20 seconds, with nearly 1.6 million such crimes nationwide annually, according to the FBI’s 2015 Crime in the United States report. That’s down 7.8 percent from 2014. Total property crime, which includes arson, larceny theft, and motor vehicle theft, reached nearly 8 million instances in 2015, down 2.6 percent from 2014. Maintain your property. Especially in the wintertime, many people stay indoors and neglect issues such as peeling trim or an overgrown yard. But if the home looks unkempt, thieves may think it’s abandoned and, therefore, an easy target. Shoveling your walkways to clear them of snow and debris and removing holiday decorations and fallen tree branches in a timely manner will signal that the home is occupied. Know your neighbors. Many people don’t really know their neighbors; it’s more than just saying hi and being friendly. Invite them over to see your home before it goes on the market, and introduce them to the people they may see regularly stopping by during this time (especially your agent). Then they’ll know who is and isn’t supposed to be at your home and can better assess when there may be a threat while you’re gone. Assess your home’s vulnerability. Walk to the curb and face your house. Ask yourself, “How would I get in if I were locked out?” The first thing you think of, whether it’s the window with a broken lock or the door that won’t shut all the way, is exactly how a thief will get in. Think like a burglar, and then address the issues that come to mind. Respect the power of lighting. Criminals are cowards, and they don’t want to be seen. The house that is well-lit at night provides a deterrent because thieves don’t want the attention and the potential to be caught by witnesses. It’s wise to invest in tools that make nighttime light automation easy. That includes dusk-to-dawn adapters that go into existing light fixtures and motion detectors. But beware of leaving your exterior lights on at all times, which signifies the occupant is gone for an extended period of time. Use technology to make your home look occupied. In addition to lighting, smart-home technology has made it easier to make it appear like people are home, even when they’re not. Systems that remotely control lighting, music, and appliances such as a thermostat can help you achieve this. Though not considered smart-home tech, simple lamp timing devices available at hardware stores are also good for this purpose. Yes, it has to be said: Lock your doors. It’s amazing how many people think they live in a safe-enough neighborhood not to have to lock their doors when they leave. Some facts sellers should know: In 30 percent of burglaries, the criminals access the home through an unlocked door or window; 34 percent of burglars use the front door to get inside; and 22 percent use the back door, according to the FBI Uniform Crime Report. Reinforce your locks. A good door lock is nothing without a solid frame. Invest in a solid door jam and strike plate first, and then invest in good locks. Know the difference between a single-cylinder and a double-cylinder deadbolt. Double-cylinder deadbolts are recommended because they require a key to get in and out. For safety and emergency escape purposes, you must leave the key in when you are home. But double-cylinder locks are against regulations in some places, so check with your local police department’s crime prevention office. Blare the sirens. Burglars are usually in and out in less than five minutes, and they know police can’t respond to an alarm that quickly. Their bigger concern is witnesses to their crime. For that reason, an external siren is invaluable, whether as part of a monitored security system or a DIY alarm. Even if you don’t have an alarm, it’s not a bad idea to invest in fake security signs and post them near doors. Mark your valuables and record details. Use invisible-ink pens or engravers to mark identifying information (driver’s license or state ID numbers) on items. Log serial numbers and take photos of your belongings. Check to see if your police department participates in the Operation Identification program. They will have stickers for you to place on doors or windows warning would-be thieves that your items are marked. These steps may prevent them from pawning or selling stolen items and can help you reclaim recovered belongings. While winter isn’t traditionally considered the best time to sell your home, there’s no reason you can’t get an offer during the colder months with the right staging. In fact, a study found that homes sold faster and for more money in the winter months, even in cold cities like Chicago. Here are five winter home staging tips that can increase your appeal to potential buyers. Whether you live in an area with heavy snow all winter or you’ve had a big storm on a day with several showings scheduled, all areas of the yard should be accessible for buyers. That means not only making sure there’s a safe, snow-free path to the front door, but also that paths are cleared to any outdoor areas the buyer will want to view. This means sheds, patios, garages and recreation areas. And while entries can get grimy if your family is in and out with their boots on, this area should be kept spotless and clear of debris. Although our instinct in winter is to hunker down indoors, put your home in its best light by opening all shades and draperies, as well as turning on all available light sources (including closet lights). The exception? Turn off televisions and computers, which don’t necessarily add to the warm glow you’re trying to achieve. Speaking of a warm glow, your home should project a feeling of warmth to potential buyers when it’s cold outside. If you have a fireplace that’s in good condition, that’s a great place to start. Try setting your thermostat a degree or two higher than usual to give buyers a reason to linger instead of heading back out into the weather. Ask a real estate company whether homebuyers in your area would respond well to layers of soft throws, rugs, pillows and other richly textured fabrics. While REALTORS® usually advise to pack away personal belongings when staging a home to create a clean canvas for buyers, tasteful holiday decorations can help create the warm, family feel you’re trying to achieve. Think lush wreaths, a tree with inviting white lights, and candles in the windows for subtle yet powerful emotional appeal. Although your landscaping won’t look as gorgeous as it does in the spring, pots of evergreens can help add some color to your walkways and yard. Always make sure that gutters are cleaned and shrubs are trimmed, too. For a home to remain in good shape throughout the winter it needs regular care and attention. When a home is occupied, many of the things that are necessary to keep it in good working order happen by default. But when the home is vacant, it is up to the owner or the property manager to prepare it from freezing temperatures and other winter risks. The worst risk comes from bursting pipes, which can lead to water damage that can significantly impact the value of the home. Left alone, water can ruin everything it touches – walls, floors, electrical systems, etc. It can even damage the foundation. Other risks exist as well, such as pest infiltration, which can leave nasty surprises for the homeowner. Taken together, the dangers of failing to winterize a home are too severe to ignore. Any real estate agent who has been involved with selling bank owned properties or vacant short sales can certainly tell you the necessity of knowing how to winterize a vacant home! In order to get an informed opinion on the subject we reached out to a well-known real estate agent in Westborough, Mass., Bill Gassett, who has been selling homes for nearly 30 years. Gassett runs a popular real estate blog known as Maximum Real Estate Exposure that offers numerous tips to buyers and sellers. Below he shares all of his tips for getting your place winterized. Hiring a professional plumber to winterize the pipes and water system in the home is extremely important if you want to avoid the incredibly expensive water damage that can occur from freezing pipes. The plumber can examine the entire system, inside and out, and then prepare it for freezing temperatures. The plumber will drain all areas where water is stored, like water heaters and hot tubs, and will use an air compressor to expel water from the pipes throughout the house. With the water removed, you do not have to keep the house heated to prevent freezing. The pipes are protected and you save money in utility costs. Water hoses must be disconnected from the home and drained of water to prevent damage to both the hoses and the spigots where they attach to the house. Left undrained, the water inside will freeze and burst not only the hose, but often the spigot as well. If winter watering must be done to keep landscape plants alive, make sure the person who does the watering drains the hoses and disconnects them from the house after each use. Close up all openings to the house. To prevent animals and insects from entering the home for shelter, you will need to close up all openings throughout the house. These include dryer vents and the chimney. Have the gutters cleaned and repaired if necessary. Gutters must be free of debris and attached properly to the house to funnel water away from the roof, siding and foundation. When debris accumulates, the gutter may stop working properly. If enough water collects and a freeze hits, the weight of the ice can pull the gutter away from the home, damaging the siding and leading to potential ice hazards where water collects at the base of the house. If you live in a cold weather climate then you understand just how bad ice damning was last year. Knowing how to prevent ice dams is something every homeowner should have a grasp of. Ice dams can cause serious damage to a home including mold behind ceilings and walls that you may not be able to detect! Have the gutters cleaned periodically until all leaves have dropped from the trees, and make sure they are in good repair. Remove anything touching the side of the house, such as leaves and firewood. Water and insects can accumulate in firewood and debris, causing damage to the siding and leading to potential infestations. Keeping everything away from the house creates a safe barrier and prevents water damage. This includes shrubbery and other landscaping. Keep a minimum of a couple of feet to allow the home to breath. Have trees trimmed over the home. Remove any tree branches that may touch the house or hang too closely. Tree branches increase the leaves that accumulate in the gutter and can also break and fall on the house in a snow or ice storm. If you are negligent about keeping branches over your home it could lead to insurance denying your claim. Use moth balls to keep insects out of the house. Moth balls may smell unpleasant, but they are effective at keeping insects away. Use them anywhere you think insects may be a problem. Talk to the gas company about disconnecting the gas supply. A gas explosion can cause even more damage than frozen pipes. Let the gas company know the home is vacant and ask them to disconnect the gas supply to the home. Obviously if you are not living in the home this becomes important because if a gas leak were to form it would be too late for you to do anything about it. This is one of the major reasons why nearly all bank owned properties get winterized. 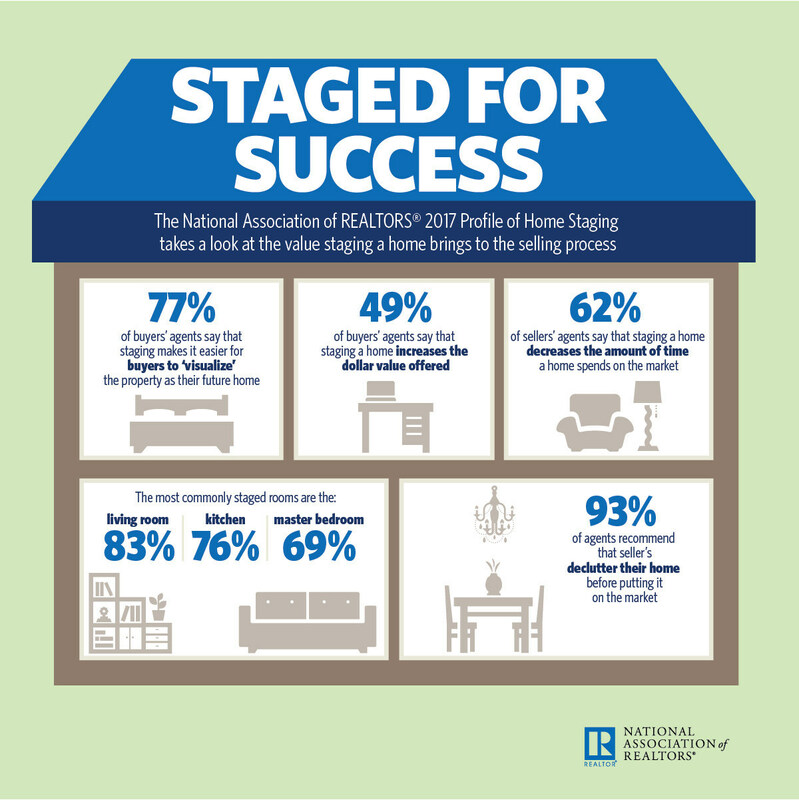 Make the home appear occupied at a glance. It is better for potential buyers and discouraging to unwanted visitors if the home appears occupied. You can setup lights on timers and have the landscaping tended to periodically to keep things looking nice. If snow is an issue you can also have the driveway cleared. We provide a list of many tips on how to sell a home in the winter. This advice applies to both occupied and non-occupied homes. Keep in mind that if your home is on the market you are going to need to get it un-winterized with fairly short notice when the buyer schedules a home inspection. Buyers will want to be able to check the heating and plumbing systems and will not be able to do so if the home is winterized. Hire a landscaper to perform a fall cleanup. As the weather gets colder, plants will die and you will be left with a disheveled looking yard and landscape. It is beneficial for the sales process if you have someone come in and cleanup around the home after the first freeze or two, when most of the vegetation has died off. The landscaper can cut back any dead growth, rake up leaves and prepare plants for the winter. Check on the home periodically. An unoccupied home, even when the lights come on and the driveway is plowed, can be appealing to burglars and to squatters. It can also be a destination for kids in the neighborhood to come hang out for fun. The only people you want visiting are potential buyers, so you should maintain a schedule of visiting the home periodically to make sure it is being left alone and to discourage unwanted visitors. Use of all these tips and your experience with winterizing a home should be a breeze! This post was originally published on RISMedia’s blog, Housecall.